Migrante International welcomes the arrest of Ma. 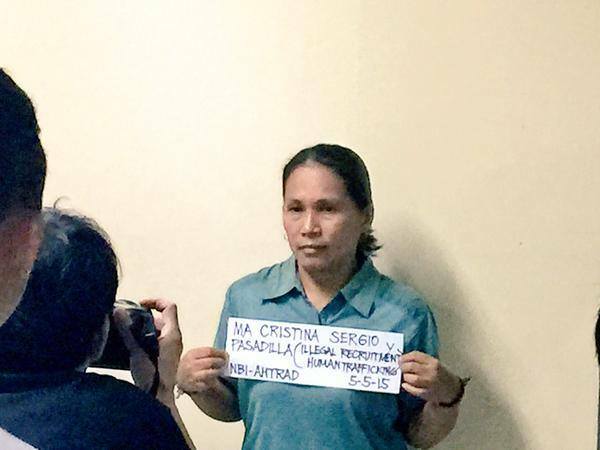 Kristina “Tintin” Sergio by the National Bureau of Investigation (NBI) last night. Sergio, and her live-in partner Julius Lacanilao, were charged with estafa, illegal recruitment and human trafficking on the basis of complaints filed by Mary Jane Veloso’s parents, Celia and Cesar, and sister Maritess, and other witnesses. Lacanilao is the “kinakapatid” mentioned by the complainants in their sworn affidavits submitted to the Philippine Drug Enforcement Agency (PDEA), Inter-Agency Council against Trafficking in Persons (IACAT) and NBI in a letter-complaint submitted to said agencies on April 16 and 17 through the National Union of People’s Lawyers (NUPL), the retained Philippine lawyers of Mary Jane and the Veloso family. Migrante, in a statement released on April 8, had also long called for Sergio’s arrest, citing the act as leverage for the appeal to spare Mary Jane’s life. “We welcome this very positive development. Mary Jane’s case is finally on the right track. Sergio etal’s recent arrest will boost calls to #FreeMaryJane and bring her home to her family and her two little boys,” said Sol Pillas, Migrante International secretary-general. Pillas added that Sergio’s belated arrest only shows that the Aquino government did “too little, too late” for Mary Jane’s case. She said that Sergio’s belated arrest should also bring to light not only the cases of other OFWs on death row but also other pending cases of illegal recruitment and human trafficking filed by distressed overseas Filipino workers (OFWs) at the Department of Justice.